· Breeze, Des, Kate and 4 others like this. This new design is responsive for both desktop and mobile devices. The new design organizes everything in an easy to read format. You can now upload an ad size that is better suited. Custom text below the footer. · Tyson and chrisville like this. We will be releasing these new formats within 12 hours. It's important that your clients view your business professionally and these new forms are long overdue. This may seem like a small update but infact its a very important part of the puzzle that we are putting together, there's clues in the screenshots . NICE! Very professional, didn't realize how bad the old design was since us producers don't ever see it. 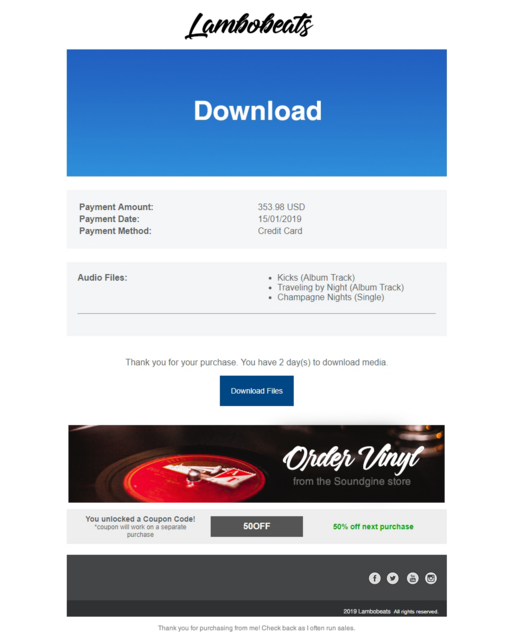 '@Tyson' Not true, there's a link to the customer download page in the email that email that tell you got a payment. I've clicked it sometimes to see that big green download page, never liked it and this new design is infinitely better. '@Breeze' Ah, didn't know that! But yeah, the amount you made big font and bold is gold. 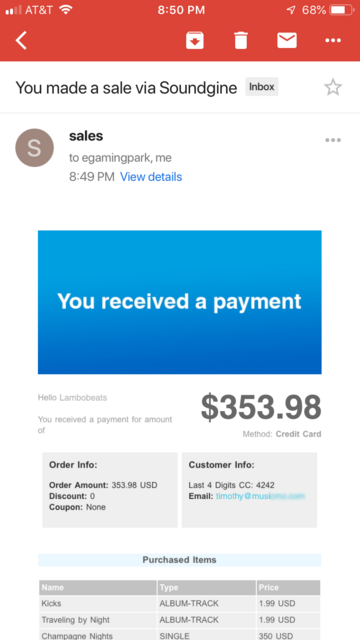 I hate scanning the whole email to see how much I made. It's looks like Soundgine is making room to sell more than just beats. VERY interesting. 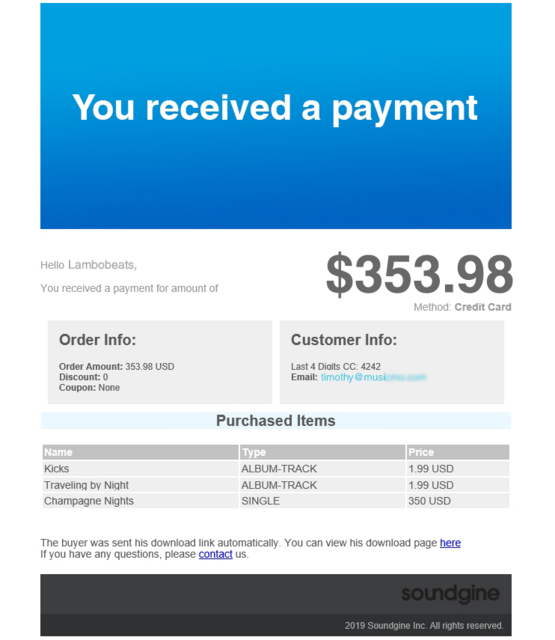 '@tone' If they do, bye bye Bandcamp for me. it will truly be all in one. Nice upgrade that customers can immediately see. Trust me, these little things make a difference. @Soundgine' We will be releasing these new formats within 12 hours. It's important that your clients view your business professionally and these new forms are long overdue. And to be honest a dedicated FAQ page is also long overdue. And optimize the mobile version of VUE. I know these are no fancy updates and won't attract new customers but I feel like they are mandatory, before everything else. I am no expert when it comes to this GDPR thing, what is allowed and what is not, so feel free to correct me if I'm wrong. '@SkillyMusic' The tricky part is that VUE is a one page website not a multi.' @Codemaker' and I will need to sit down that think of a way to incorporate this, but yes, we agree that you need these extra pages. VUE is indeed due for some updates. @Soundgine'' @SkillyMusic' The tricky part is that VUE is a one page website not a multi.' @Codemaker' and I will need to sit down that think of a way to incorporate this, but yes, we agree that you need these extra pages. VUE is indeed due for some updates. I got you. Looking forward to the updates! Also you can add some extra text below the header. Just made a sale and noticed that "DOWNLOAD FILES" box is missing ? Strange, are you viewing this on mobile? desktop email client? 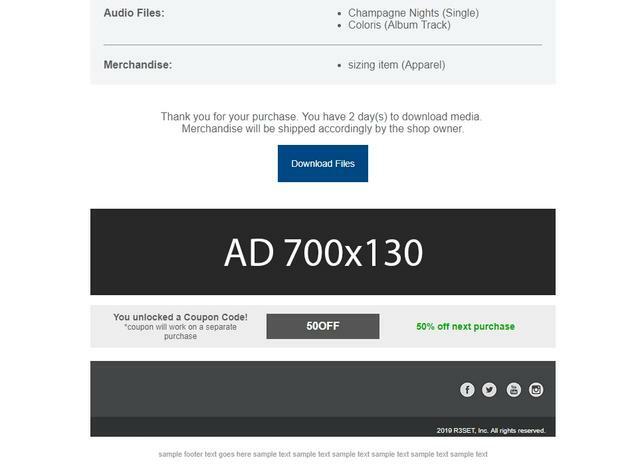 Also, is this screenshot from the download page or email. 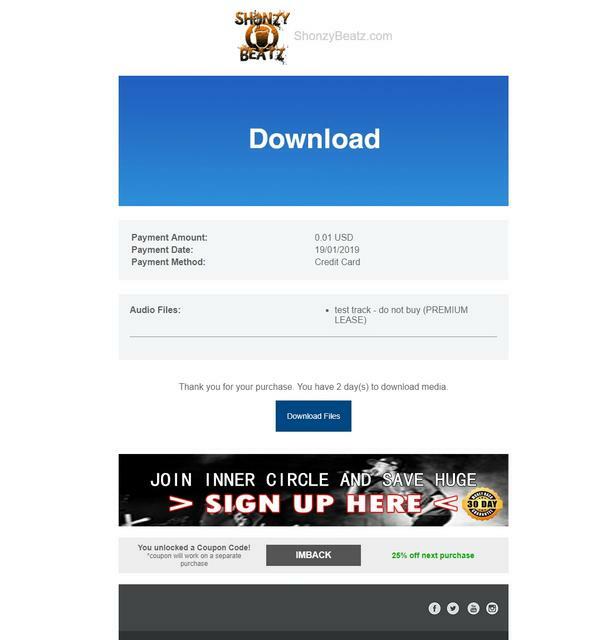 If this is the download page from your desktop, please forward that link to technical@soundgine.com please, thanks. We did some testing on your account and we could not replicate the issue on both desktop and mobile, the download button appears on both.